I’ve long admired the dark moody ballad Your Love Is Like A Chain Around My Heart. The bluesy chord changes are right up my street, as are the horn blasts, and Carolyn’s brooding vocal suits the mood precisely. 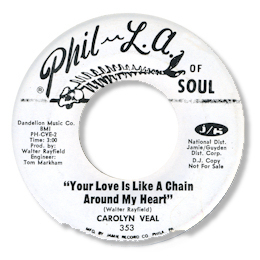 Although it was issued on a Philly label, Harold Lipsius' Phil-LA-Of-Soul had a policy of leasing material in – and I think this one came from Florida. The name of Tom Markham as the studio engineer means a Jacksonville recording to me. I just wish there were more tracks from Carolyn like this. UPDATE ~Dave Chichester has written with details of what could be an earlier release for this fine disc - and has also supplied the pic of the label. Ditanfra was based in the Virgin Isles and the 45 was apparently a big hit on the Carribbean. So was the 45 recorded there and then issued in the US later? The label of the Ditanfra says so but the fact that Tom Markham is credited on the Ditanfra 45 as well as the Phil LA Of Soul disc might mean that the US release was the first one - or it could just man that he was instrumental in getting the tracks over to the US - or perhaps remixing them. Or maybe he went to the Virgin Isles for a holiday. Can anybody offer a definitive answer? In any event I'm really grateful to Dave for his excellent detective work.